The London West Hollywood, the most sought after property in Los Angeles, will once again transform its coveted rooftop into a seasonal oasis with the addition of a special occasion tent. Available for parties, events and weddings, this chic, transparent tent highlights the 360 degree views of the Hollywood Hills that the property is known for. Reminiscent of the massive tents seen during Fashion Week, the structure stands 36 feet wide, 100 feet long, and 10 feet high to accommodate any type of prop or decor, and up to 350 guests for a reception style event. Heated for festive winter parties, keeping guests cheerful and comfortable, the venue offers the option of a grass floor to give a more casual, organic feel, but can also be covered for a contemporary, sleek look. Full service catering from the celebrated Gordon Ramsay culinary team completes this unique event experience, or planners may also opt for a caterer of their choice. In addition, The London West Hollywood offers a special Fireside Bites rooftop dining experience through the season for guests to indulge in scrumptious treats, warm drinks, and unparalleled views of holiday lights and festivities. The London West Hollywood Rooftop Tent is available for all special occasions from October 24th through April 2012. For more information about hosting an event at the hotel, contact Summer Stearns, 310-358-7757 or sstearns@luxuryresorts.com. Just steps from the legendary Sunset Strip, The London West Hollywood is a fusion of both its namesake cities – smart, modern and evoking the utmost style. Distinctively imagined for LA, interiors are designed by the renowned David Collins Studio, dining by acclaimed chef Gordon Ramsay and bath environments by posh purveyor Waterworks. Highlights include incredibly spacious guest suites with private terraces, a panoramic rooftop pool deck, Alex Roldan Salon, offering hairstyling, nail and makeup, bistro style Boxwood Café, and Gordon Ramsay at The London West Hollywood restaurant, awarded a Michelin Star rating. 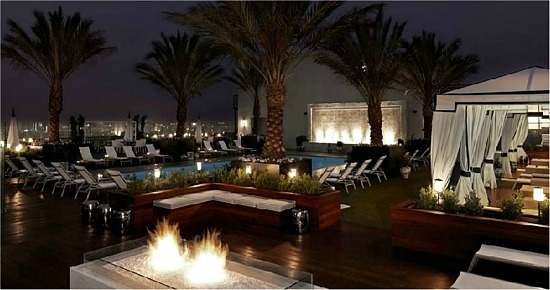 For more information call (866) 282-4560 or visit www.TheLondonWestHollywood.com.